The figure of the 'bush-lost' child is a potent theme in our cultural remembering and has recurred throughout art, film and literature, for example in the paintings of Frederick McCubbin and in films such as Nicholas Roeg's Walkabout. In her latest series Haunted Country Polixeni Papapetrou explores this theme photographically, creating images that embody real and fictional accounts of children who have gone missing. Papapetrou draws the viewer into the emotional space of the photograph, to experience the undercurrent of the psychological drama unfolding. She considers the impact of these stories on our understanding of country and community. How do we feel when a child goes missing? Who do we blame? How do we deal with it as a community? 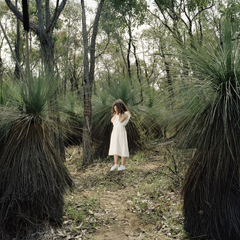 Papapetrou's scenes are set in different eras and were staged at sites within Victoria such as the Wimmera, Daylesford and Hanging Rock, where children became lost (albeit fictional with the latter). Most of the stories suggest nature was the culprit responsible for stealing the children, reflecting the fearful European response to the Australian landscape. Papapetrou also extends the accounts to include more recent stories about the disappearance of children who vanished without a trace from public places, such as the beach and other holiday destinations. These stories, full of unease, are deeply embedded in the cultural memory. Throughout earlier bodies of work Phantomwise (2002-3), Dreamchild (2003) and Wonderland (2004) Papapetou has used the realm of childhood (with its abundance of imagination, transformation and the exploration of boundaries) to explore the formation of identities. These were all studio-based works, the vivid backdrops and props encouraging leaps of imagination and belief. The natural backdrops in Haunted Country function similarly to the studio, asking the viewer to enter the psychological space of the image. This time it is vulnerability, something most pronounced in childhood, that is a powerful force. If these lost children never return, they continue to exist in the imagination, where they remind us of the inhospitality of the land and sometimes its inhabitants. Their presence in this Haunted Country is written into our personal and public history. Haunted Country is to be featured in the prestigious Aperture Magazine later in the year to coincide with an exhibition in New York. Papapetrou's work has been widely exhibited in Australia and internationally, in over twenty solo exhibitions and fifty group shows. In September 2005, Dreamchild and Wonderland, were shown at Le Mois de la Photo, 9th Montreal Photography Biennale in Canada. Papapetrou's work is held in major public and private collections in Australia and overseas.